Several readers commented in last week’s post on trousers that they would appreciate something similar on cardigans in such outfits. So here we go. I will largely be talking about sleeveless cardigans (although given we will assume they are being worn under jackets, it makes little difference whether they have sleeves or not). I will also leave odd waistcoats aside, because they actually have little in common stylistically with cardigans. First, cardigans are great. They cover the waist of the trousers; they keep an errant tie under control; and they are an one of the easiest ways for a man to add a little colour – much more subtle than socks or handkerchiefs. Having said that, you should start with the dominant duo of menswear: grey and blue; specifically, mid-grey and navy. 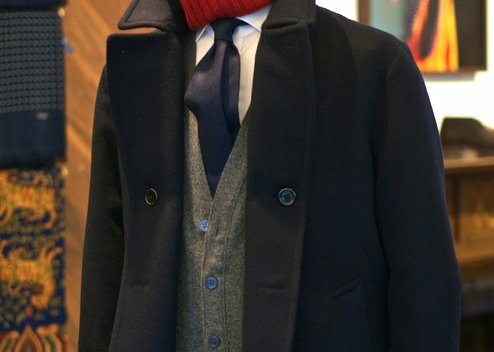 As with so many other things, a navy cardigan will be the most versatile colour you can own. 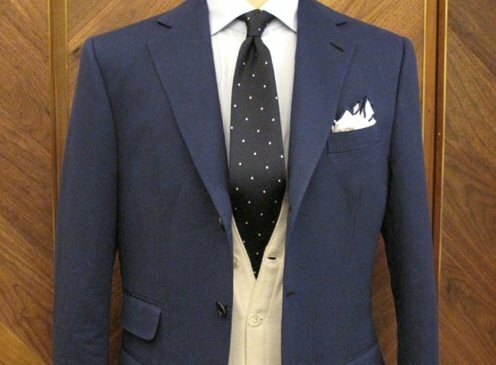 It can be added for warmth under any other colour of jacket, except perhaps another, ever-so-slightly different navy. It will act as a shadow under the jacket, slimming the waist and highlighting its sweeping fronts. 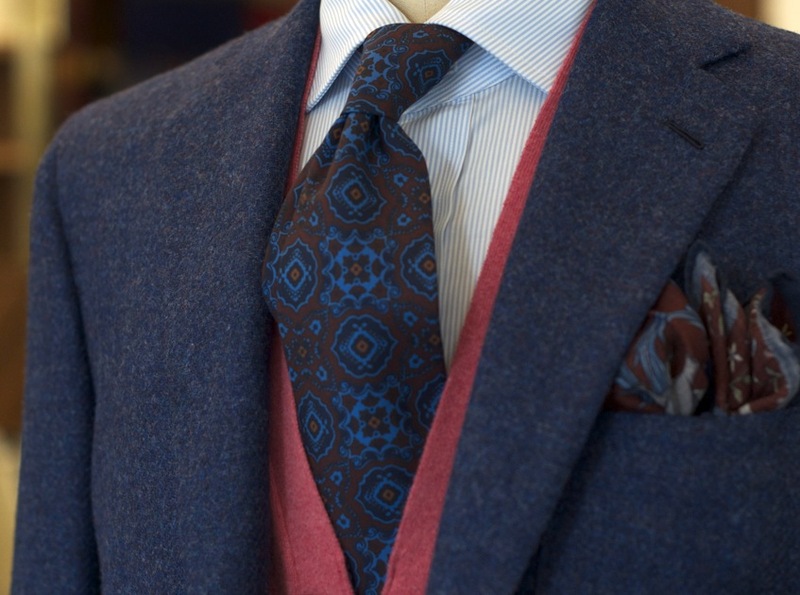 It can ground other, brighter colours and patterns, just like a navy tie. In the tricky area of separate jackets and trousers, it can be a god-send. Second is mid-grey. As with any mid-grey item – suit, flannels, crewneck sweater – it is less formal and often works better with particularly bright colours, such as pinks and yellows. 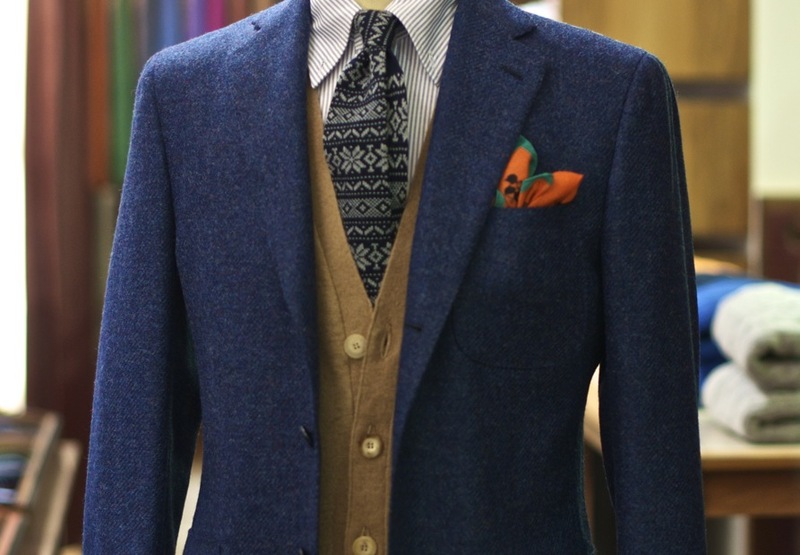 A brightly coloured cardigan is a great way to add panache to an otherwise conservative outfit. 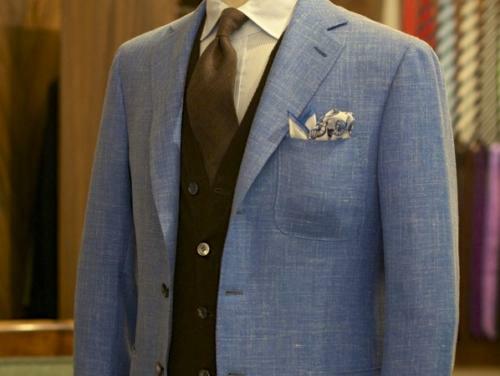 As with anything of such brightness, however, it can often dictate the rest of the outfit, requiring it to be either all conservative and quiet or all similarly loud. Another option is cream. Bright but subtler than orange or turquoise, it works particularly well with a blue shirt and grey flannel suit. I own four Drake’s sleeveless cardigans – navy, grey, cream and caramel – and while cream gets easily the least usage, it has the most pleasing effect when it does come out. Of the other second-level colours, caramel might be the most versatile. It goes particularly well with navy. Other great options are dark green, obviously, and purple. As to how to wear them, cardigans will always look more relaxed with a few buttons undone, and are normally cut so high that having one or two undone at the top is more flattering. On a five-button cardigan, as shown largely here, try with the middle two or three done up. Drake’s cardigans suffer from the same problem as most knitwear, in being too boxy for a slim guy. I adjusted mine myself. You can follow the discussion on How to wear a cardigan by entering your email address in the box below. You will then receive an email every time a new comment is added. These will also contain a link to a page where you can stop the alerts, and remove all of your related data from the site. John Smedley cardigans are great – not boxy for many of them and merino wool is great under a jacket. On top of that, they can be ordered online. I agree with you completely Simon – cardigans are great! If worn formally (with jacket) I think they help form a powerful ‘V’ shape in combiation with shirt collar, tie and jacket lapels. During winter I also often wear a thick cashmere 3 ply navy long sleeved cardigan (no buttons done up) over a thin merino or cashmere V neck with jeans – I find it an informal alternative to a jacket for Sunday lunch at a country pub. A very welcome post. I’d noticed the trend in leaving the top one undone and was pleased to see an explanation for this. I wore my navy cardigan yesterday. I buttoned it at the top because I was wearing a Churchill bowtie, and thought it best to follow Flusser’s advice about minimizing the expanse. Great article. As an aside the odd jackets in the article are beautiful. Could you give a rundown of each one? I have a couple of knitted cardigans that I plan to take in at the waist myself, but I haven’t figured out what method would work best, hand stitching or sewing machine? How did you do it? Hand stitching is always safer, but it does take a while. At the very least, baste it by hand first to make sure you have the right amount taken in. Even where it for an hour or so to be sure. Did you cut away the excess fabric afterwards? I always felt a cardigan is too casual to wear with a suit. If I were to add colour to my outfit this way I’d probably choose a doeskin waistcoat, inspired by Oliver Wendell Douglas on Green Acres. 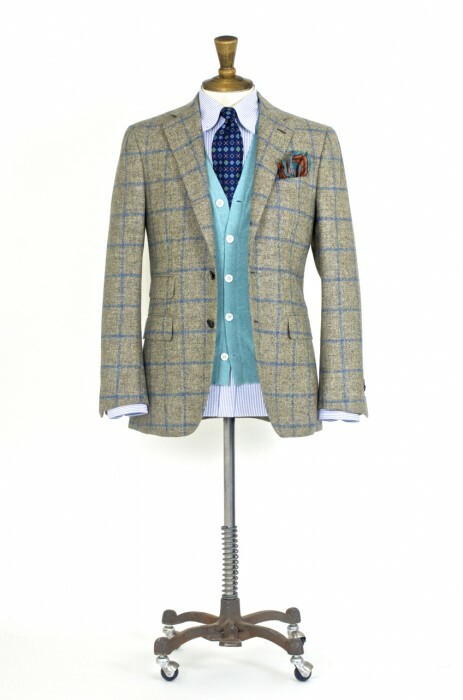 I agree that it is too casual to wear with a business suit, but it would go well with a tweed suit. I agree with Matt Spaiser on the intrinsic casualness of the cardigan. I own a cream waistcoat that serves the same function as your cream cardigan. What are your thoughts on the two, Simon? Apologies, it is a heavyweight cream linen waistcoat, for further clarification. Great article, could you please give some information about the grey windowpane blazer in the first picture?